At Tadi Brothers, we know you can’t rely solely on your rear view mirrors to avoid blind spots. That’s why we’re pleased to offer products that provide you with the utmost viewing capability when backing up your RV or other large vehicles. 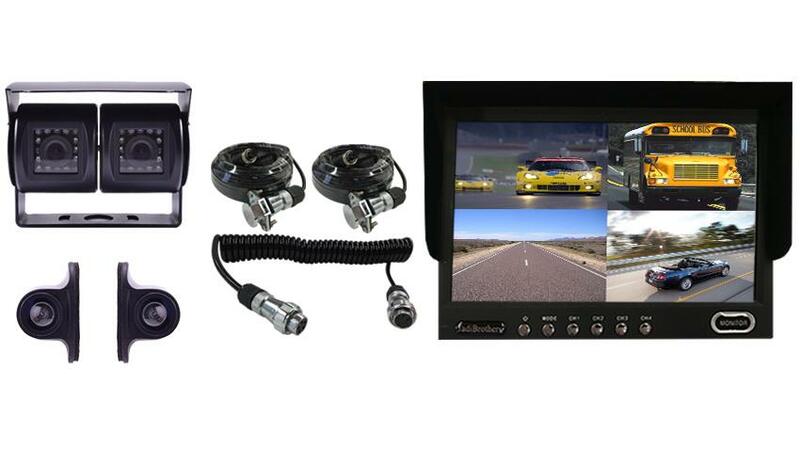 Our 7" Ultimate RV Backup Camera System with Double CCD RV Camera is one of the best in our line. It includes the Double RV box camera and two side cameras to provide incredible adjustability and clarity. All our cameras are waterproof, have military grade night vision and an expansive 120° viewing angle. The system includes all parts necessary to connect a One camera system to your Truck and 5th Wheel. You connect the box camera to the top part of your 5th wheel (Photo 1.) You then run the 70ft cable provided (Photo 2.) from the camera at the back of your 5th wheel to your hitch. At that point, you connect the 70ft cable to a second 20ft cable (Photo 4.) with the Quick Disconnect provided (Photo 3.) That 25ft cable connects to your monitor (Photo 5.) Now you can see the whole world behind you! The adapter allows you to disconnect the 5th wheel from the backup system (Photo 3.) when you are not towing it. TadiBrothers also offers different disconnects in different sizes. We have heavy duty and industrial duty disconnects, you can add it using our item options on the right side. We also offer up to 4 cameras using the same Quick Disconnect. The Double RV Box camera contains a dual lens that allows you to point one camera at the rear and one at the hitch for simultaneous viewing. Or you can adjust it any way you want! All Tadi Brothers cameras offer the utmost in durability. They are completely weatherproof and waterproof, offering a clear view in all weather conditions. The metal sun shield visor protects the lens from damage and the driver from harsh sun glare. The versatile housing allows you to install the cameras on multiple sides of your RV. The versatile lightweight LCD monitor is compatible with all our cameras and any car. The 7'' full color, split screen has four video inputs so you can connect multiple cameras, a gaming system or a DVD player. You have the option to view one camera or all four in a split screen with the touch of a button. It connects easily to any power source or a cigarette lighter, and can mount on your windshield or dashboard with hardware and cables that are all included. We make installation is a breeze! All cameras, monitors and DVD players purchased from Tadi Brothers are always compatible with each other. So feel free to mix and match to create your own ultimate vehicular system. At Tadi Brothers, we’re passionate about enhancing your safety on the road. We provide 24/7 tech support for any questions or problems. All our products come with a 30 day guarantee to return the item for an exchange or a full refund. "Replaced a single factory birds eye view camera with the TadiBrothers dual camera. Now I can see both the near-bumper/hitch view AND the far view of my driveway and parking lots. Just what I needed without having to mount a 2nd camera. I upgraded to CCD and the picture is very clear. I ended up modifying one grommet to pass both camera wires, to avoid drilling a new hole in the back of the RV. A single grommet option would be nice to have in the future."